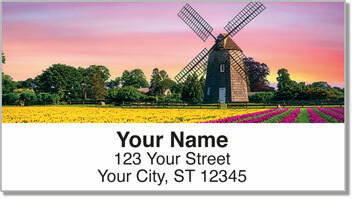 Put the picturesque charm of old-fashioned Dutch windmills on all your letters and packages using these original return address labels. Each of the four designs in this set features a completely unique scene including silhouettes of windmills after sunset, quaint windmills surrounded by tulips and more! 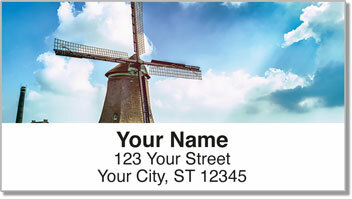 Dutch Windmill Address Labels from CheckAdvantage let you stick a bit of the Netherlands on every envelope you mail! Plus, you'll save a considerable amount of time preparing outgoing mail thanks to a convenient self-adhesive backing. 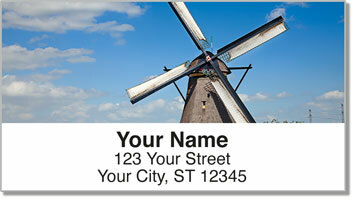 Order your very own Dutch Windmill Address Labels right now! 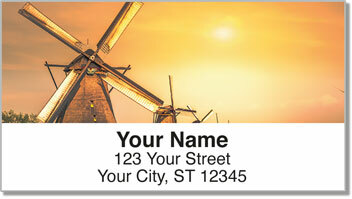 This design is also available as a set of matching personal checks.